A 3-month-old baby girl (Figure 1) was referred from another hospital because of a right upper lid coloboma which was present since birth. There was also a notch on her nose. Otherwise, her development was normal. There was no family history. 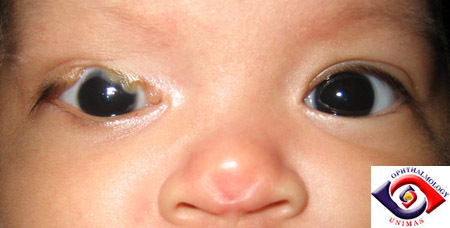 Examination showed a upper lid coloboma of 50% of the upper lid width. There was a flap of skin attached to the cornea centrally. The corneal exposure was present when the patient slept. Fortunately, the cornea appeared intact as the mother has been applying lubricant at night for the past few months. A decision was made to close the defect and the patient underwent a lid closure procedure. attached to the cornea centrally. a. What additional examination should be performed? b. In adult, Cutler-Beard's technique and lower lid transposition flap are often used to correct a large upper lid defect. Why are these techniques not suitable for an infant? c. Name three appropriate techniques for closing the defect in this patient.